First, I had carabiners fail because of user error. I got some Omega ‘biners from NRS and their inner springs failed due to corrosion. I tried rinsing them after each trip, but I assume I didn’t rinse them thoroughly enough. Now they sit in my garage, useless in real world situations. Next, I got a nice towing cowtail from Level Six, which came with a wire-gated, paddle-shaft-width carabiner. This had two problems. First, like most carabiners, it had a notch for the gate, which always catches on webbing and rope. Bad news. Break out the Dremel! Second, like most paddlers, I clip the cowtail’s ‘biner to the front of my PFD, for each access, but the zippers on my drysuit’s arm pockets would get caught in the wire gate itself while paddling. Seriously not good. This led me to research carabiners to find ones that didn’t have wire gates, wouldn’t corrode, and would be sturdy enough to tow folks, do swiftwater rescues, and to even haul kayaks up cliffs if needed (as seen near the end of this rather intense video). 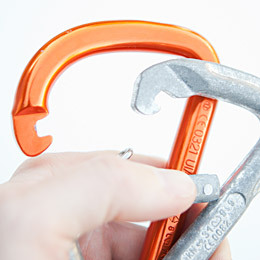 My parameters took me right to the CMC Rescue Stainless Steel Carabiner (called the SSC hereafter due to lazy fingers). This thing is almost embarassingly large: Not quite big enough to go around a paddle shaft, but its opening is wider than most ‘biners. It can withstand 44 kN of force along its long axis, 50% to 100% more than any other carabiner I own. Praise Neptune and the Gods of the Sea, it is notchless. CMC Rescue claims the SSC to be the most corrosion-resistant ‘biner available, and after paddling with one as part of my towing kit on a Mono Lake expedition, a body of water three times saltier than the sea, I’m inclined to believe it. Its most unique feature is its locking mechanism: It auto-locks as soon as the gate is closed. It is opened first by pulling down, then twisting, then leaning the gate back. When it opens, it actually leans off-axis to one side, allowing a much greater open width than if it simply moved inwards, which is great if you intend to use the ‘biner with webbing instead of rope. 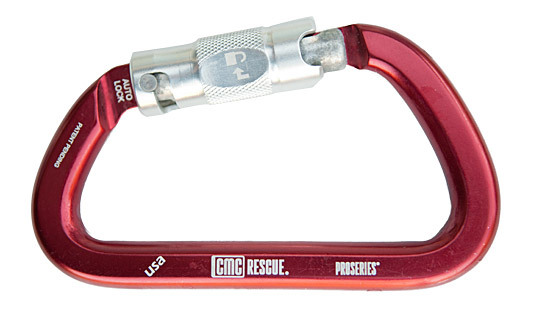 This auto-lock mechanism is the CMC Rescue SSC’s greatest asset and its greatest hassle. The resistance of the locking mechanism is pretty intense, and paired with the size of the ‘biner, it takes a lot of practice to release the gate one-handed. On land. When it’s dry. On the ocean with wet hands, swell, wind, and conditions that might make a tow most necessary, it’s a two-handed operation. With practice, though, I’ve found that it doesn’t take but a moment to open, and it can stay open with one thumb quite easily. One bit of constructive criticism I’d offer, however, is even more aggressive knurling on the gate itself for wet conditions. There is an indentation for one’s thumb which feels ergonomically sound, but it has no knurling, and its smooth face seems like a design flaw for something intended to be used when wet. 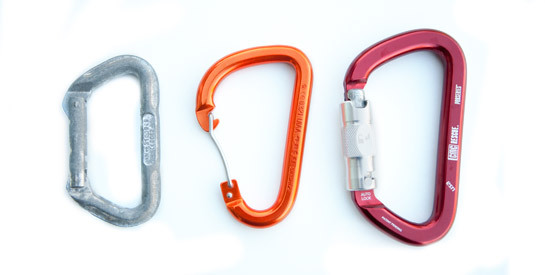 Again, these things require practice to use, unlike other carabiners. But, they’re a hell of a lot faster – as in instant – to lock than a standard spin-a-bajillion-times style of locking-gate ‘biner. And, you guessed it: They ain’t cheap. But, you do seem to get what you pay for: A bulletproof, notchless, corrosion-resistant rescue carabiner that really does feel like it could truly support lives that might hang in the balance…assuming you can become conversant with their use and accept the challenges of such a strong locking mechanism. A notchless Locking biner, that is cool. For rescue-awesome. For towing I’m attached (ha) to a simple notchless just because of remembered times trying to unhook in a tense situation with bouncing boats and the need to vamoose. The extra cold finger dexterity required in these chaotic movement situations would make me worry about getting the gate open. Your design sense is impeccable. I am glad the color also fits in my Blk/Red/Wht theme so I can add it to my rescue gear. As a gal with smaller hands than the average guy, I found these fairly difficult to unlock with one hand, and I share Chris’ concerns about unlocking them with cold hands.